When military orders come along, and there’s a new assignment on tap, it's a good idea to find out what the weather is like at your future home. All right, I’m not trying to play the drama card from watching the Weather Channel, but there are climate conditions to contend with, no matter where you're stationed in the U.S. When looking up weather reports for the West Coast, you may hear of drought and the threat of wildfires. Meanwhile, mountain ranges and the Southwest post warnings of flash floods or mudslides after heavy rain. Over yonder in the Midwest and along the South, severe thunderstorms and tornados stir havoc. Those who live around the Great Lakes may experience “lake effect” ice and snow. Old Man Winter often visits New England with blustery “Nor’easter” storms. Strong winds and flooding can occur when hurricanes or tropical storms hit the Gulf or along the East Coast. When looking through MilitaryByOwner listings to potentially buy or rent a home, browse for photos with the ad that depict the property from season to season. If the pictures don't reveal weather details, you'll want to do some research about what to expect. 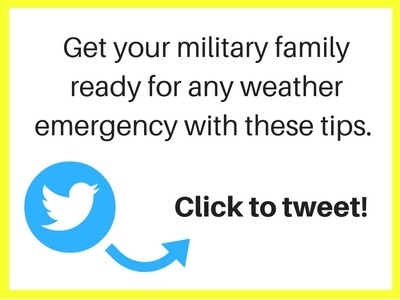 From the West Coast to the East Coast to a military assignment anywhere in between, it's a good idea to be weather-ready and make preparations in case of severe weather. 2) File important documents safely. For papers such as birth certificates or passports, consider investing in a waterproof and flameproof safe or container. 3) When the forecast looks stormy, it may be a good idea to compile an emergency kit. I love a good carryall bag, especially with pockets out the wazoo! If you find a waterproof bag that offers plenty of storage pockets, that marvelous item may come in handy for collecting the items of your emergency kit. For each person in your family, pack a fresh set of clothes and sturdy shoes. In case of power outage, you may not be able to use your debit card or access an ATM for cash. Plan ahead by having a small amount of cash on hand. Additionally, for each person in your home, stock up on water. “A gallon per person per day” is the ratio. 4) Don’t forget Fido and Fluffy. Plan to pack enough water, food, toys, doggie bags or kitty litter and any medications for your dog or cat. 5) Prepare ahead to save time. If a severe weather alert is for a hurricane, you may have enough time to plan before you evacuate. Having a first aid kit, an emergency kit, additional useful items, and those important documents all gathered in an easy to find location might save you time and, hopefully, ease any stress. 6) Know what to do in an emergency. Look up the “emergency response plan” for your community, usually noted on a state or city website. Discuss an evacuation plan with your family and for your pets. Have a paper map handy to highlight the route you plan to take, in case of connectivity issues with your GPS or smartphone. While discussing emergency preparedness, here’s a personal story. Many moons ago, I served as a young volunteer with a Red Cross disaster response team office. From that experience I learned some helpful tips for what to do after a natural disaster occurs. If your home office has been damaged and important documents strewn about, contact your credit card companies. Let them know your situation and they can place alerts on your accounts to prevent identity theft. Contact your cable and internet company and ask them to suspend service, so that you're not paying for services you can't use. Take a trip to the post office and have your mail forwarded to another location, perhaps to the address of a family member or a post office box in another area. When you're settled again, contact these companies to clarify that the alerts are lifted and restore your previous settings as you're able. Of course you’ll need to file a claim with your home insurance and car insurance. Take photos of everything as added proof. Be aware the incident may be considered a state disaster and not a federal issue that requires FEMA support. If your vehicle has been critically damaged or swept away in high water, rather than risking further damage by attempting to start and move it yourself, it's recommended to wait for a towing company to transport it. Ask the local trash service for the guidelines of curbside pick up. The debris may need to be sorted into three piles: wood, metal, and household goods/furniture. A disaster may draw dishonest characters under the guise of recovery and repair. Before giving anyone money, check the references of the repair companies to ensure you're working with reliable entities. 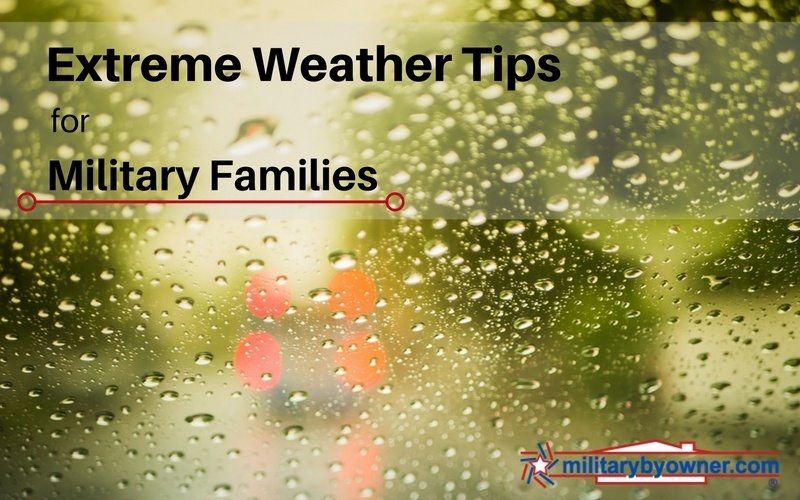 For more information on preparing your home or rental for inclement weather, browse other posts on the rest of MilitaryByOwner's blog. Wherever you land with your next military move, here’s hoping for blue skies and enjoyable weather!